Another gem that I found while I was in the Galleria Vittorio Emanuele II was the hat atelier of Gallia e Peter. It is the most famous millinery in Milan. The things that attracted my attention to this particular shop was the colour and the form. I learned from their website that Gallia e Peter collaborates with fashion houses for their fashion shows. I highly recommend that you have a look at their website for amazing images of the creations they have made for different fashion houses. I wonder if certain people order their hats from Gallia e Peter for the Royal Ascot. And if they do not…they should. These people are the masters of their art and do not lack ideas nor ability to create the most fantastic headpieces. You can see the beautiful and unique creative minds at work in the bridal section of their website. I will definitely keep this Atelier in mind if I want a unique headpiece for a special occasion. 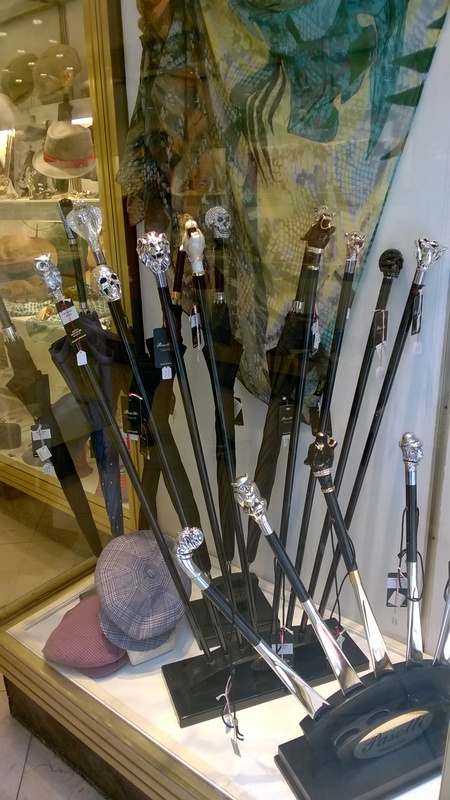 The shop had in display a set of walking canes and tongues for the stylish male customer.